When a car-size rover flawlessly stuck its Mars landing Sunday, NASA's live broadcast of the event transformed an unsuspecting engineer into an Internet sensation — making him just as famous for his eye-catching hairdo as for his work on historic Red Planet arrival. NASA's "Mohawk guy" Bobak Ferdowsi is a systems engineer for the Mars Science Laboratory, or Curiosity rover, mission at the space agency's Jet Propulsion Laboratory (JPL) in Pasadena, Calif.
During the live NASA TV broadcast of the Mars landing, camera views from inside JPL's Mission Control room frequently showed Ferdowsi with his over-the-top Mohawk, complete with blue and red highlights and white stars bleached into the closely cropped sides of his head. The shots transformed Ferdowsi into an internet star, earning him the nickname "Mohawk Guy," and attracting comments, tweets and photo tributes. Ferdowsi (who tweets under the username @tweetsoutloud) has picked up more than 20,000 Twitter followers since the Curiosity rover's landing, and an admirer even created a special Tumblr site about him, reported NBC News' Cosmic Log. A selection of marriage proposals sent to Ferdowsi via Twitter was also cobbled together by The Huffington Post in the wake of the successful Martian landing. Still, the NASA flight director has yet to come to grips with his newfound internet fame. "It's a little surreal," Ferdowsi told NBC News. "I'm still just getting over the 'We're on Mars' thing. That's the thing I can't believe." 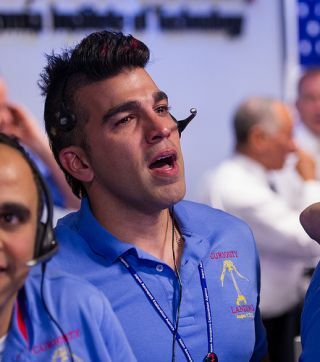 But Ferdowsi, who has worked at JPL for nine years, is no stranger to dramatic hairstyles for his missions. According to NBC News, he sports a new 'do for each space mission that he works on. The suggestions are settled by a poll among his co-workers. For Curiosity's landing, several potential hairstyles were in the running. "We had a Martian red," Ferdowsi told NBC News. "One vote to shave my head. Natural black. Then we had the Captain America look." And it turns out the so-called Captain America Mohawk was a hit. But at the end of the day, Ferdowsi, who was so focused on his job at the time that he didn't notice the online frenzy he was creating, simply hopes that his new admirers will share his excitement about the Curiosity rover's mission on the Red Planet. "I hope that they are as excited about Curiosity as I am," he said.